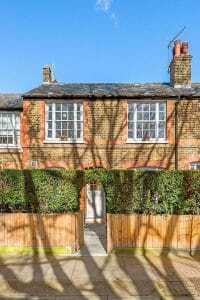 This two bedroom Battersea flat rental is along the traditional street of row housing flats on Reform Street, near Latchmere Road. Just down the street from the green space on Latchemere, there is much to see at this reasonably priced space. Upon entering this second story unit you are greeted with the front window adjacent the decorative fireplace that’s maintained its architectural beauty. The carpeted and spacious area leads off to the white and well-equipped kitchen that has butcher block counters and all the appliances any cook would need. The master bedroom is very well sized and the second bedroom great for a share, a spare bedroom or its center walled window would make a great backdrop for a home office desk. This window overlooks the spacious outdoor living space that makes this unit likely to go fast. Both bedrooms offer built in storage and great natural light. The outdoor garden surrounds the sizable patio that’s equipped with a full countryside farm table and accompanying deck seating. Grow what you like in the already prepared self-contained garden beds. With a full privacy fence and decorative lattice, you’ll find yourself wanting to spend much of your time outside. 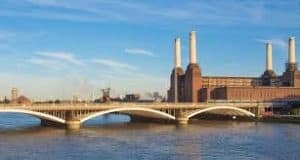 The convenience of this Battersea flat rental begins with its close proximity to Battersea Park and just a short jaunt to Clapham Junction. Chelsea is also a quick commute just over the bridge and you’re just a stone’s throw to the rail station. When suppertime approaches you’ll often want to visit nearby Kings Road. Maroush is the spot for the best in Lebanese and Marco Pierre White for traditional cut steaks. Kings Road is also home to Eight Over Eight with Asian cuisine, and Medlar, Restaurant Gordon Ramsay and Sinabro having traditional French food. Also in the area surrounding the Battersea Rise is Adventure Bar that offers live music and events. For local pubs off Battersea Rise, you can choose from The Goat or Hawkins Forge that offers oval-shaped pizzas and big screens for sports. The Sporting Page is the other pub nearby that caters to the sports fan, and The Cross Keys, The Pigs Ear, and The Roundhouse are great pubs, with the Roundhouse being a circular put decorated in a 1940’s throwback décor. This Battersea flat rental is just perfect for a professional couple who need to commute to the City or for roommates to share. Priced at less than £2,000 pounds a month, it’s sure to go quick.